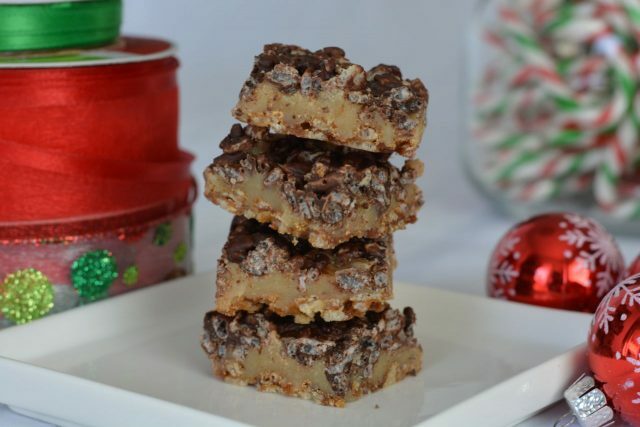 ‘Tis the season for indulgence…and these toffee squares certainly meet the criteria. I love baking in my kitchen and I don’t care so much for shopping in malls. My gift shopping starts in the grocery store and that is just the way I like it. I call this recipe Kathy’s Easy Toffee Squares and it’s the kind of recipe kids can make. Using gluten free Rice Krispies (still available in Canada) and brown rice flour it was easy to recreate. The magic ingredient (that is popular during the holiday season) is sweetened condensed milk. To me nothing says holiday baking like sweetened condensed milk. As the name implies the milk is condensed by removing water then sweetened. It is naturally gluten free so this is a recipe to add to your collection. Last year I was telling my son and his friend about sweetened condensed milk as they were about to make these. I described it as the magic ingredient used in recipes we only make at Christmas. His friend looked at the label and exclaimed “it says it right here…it’s a magic ingredient”. In this recipe the other magic happens on the stove and you only need to stir and pay close attention. There are three layers also making these squares worthy of being called a holiday treat. If you follow my directions you will get a slightly thicker version than you see in my photo and the layers will be more clearly defined. I was trying to see if I could make these squares thinner…trust me, just follow the directions. I like to teach kids to bake. Encourage them to get in the kitchen and see a little science happening. To have fun creating something and at the same time create memories in the kitchen. So please encourage any children in your life to make or bake something and have fun doing it. I’d love to hear what kids think is the fun part of working in the kitchen so please share. And if they have a question for me I would be more than happy to answer that in the comments below. By default I think kids having fun in the kitchen baking will eventually make their way into the kitchen and learn to cook what I fondly refer to as ‘real food’…and that is a skill that will last a lifetime. Grease an 8” x 8” baking pan. Mix the base layer ingredients together and press into the pan. Bake in 350°F oven for 10 minutes. Set on a cooling rack while making the caramel layer. In a medium size pot combine sweetened condensed milk, butter and brown sugar. Bring to a full boil and cook for 5 minutes stirring almost continuously to prevent burning. Pour evenly over the base layer. Set aside. Put chocolate chips in a small bowl, microwave for 1 minute. Stir. If not completely melted microwave another 30 seconds. Mix Rice Krispies and melted chocolate. Put on top and gently spread it over the caramel with the back of a spoon. Chill completely. Once cold you can bang it out of the pan upside down and flip it right side up with your hands. Cut into pieces any size you like. Taste to make sure they are delicious. Package the squares in little cellophane bags, boxes or tins and give as gifts. Absolutely! Just replace the total amount of flour with the same amount of regular wheat flour. These sound divine! Can you make them not gluten free by using regular flour?